Amusement park deaths and injuries occur far more often than most people assume or like to think about. According to USA Today, amusement parks and carnivals saw an increase in the number of chilling accidents in 2016. In May, a little girl’s hair got caught in a carnival ride and her scalp was ripped off. In August, a 10-year-old boy died after sustaining a neck injury at a Kansas waterpark. And in that same month, three little girls were injured after falling out of a Ferris wheel in Tennessee. Those were not the first amusement park accidents to ever occur, but they did draw attention to the fact that parks need to take measures to drastically increase the safety and wellbeing of their attendants. Until that is done though, victims and their families want to know who can be held responsible and what, if any, legal protections they have. Our experienced Miami personal injury attorneys at Spencer Morgan Law can review the circumstances surrounding your case and help you determine what, if any, legal actions you should take. Do You Even Have a Case? 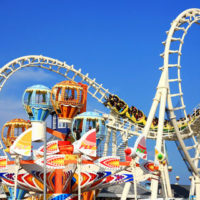 Just like all premises liability cases, the key to determining legal responsibility in an amusement park accident case is proving that the park attendants and/or its equipment was somehow responsible for yours or your loved one’s injuries. For instance, the little girl who had her scalp ripped off was swung around for 10 whole minutes by her hair before the ride attendant realized and finally stopped the ride. The little boy who sustained the neck injury and died jut fell off the world’s tallest water slide. And the three little girls that fell out of the Ferris wheel no doubt only did so because they were not properly latched in or the latch was faulty. In each of these instances, it was clearly the fault of the equipment or an attendant that caused the accident. However, while those are clear instances of liability, slip and fall accidents occur at amusement parks all the time, and those types of accidents—no matter where they occur—are always difficult to prove. Food poisoning cases are also difficult to prove and would require a significant amount of evidence in order to win. However, with a strong attorney on your side, winning is not an impossible feat. One thing stands true in all amusement park accident cases, though: amusement park owners have a basic obligation to ensure all visitors are safe on their premises. That means ensuring that all rides are properly assembled and maintained, that all hazards are removed from anywhere the public has access to, and that all food is stored and cooked properly before serving. Additionally, owners must take reasonable measures to identify hazards and correct the problems before they open their doors. Visitors must receive adequate warning of any hazards that cannot be fully eradicated. Many amusement parks try to claim that visitors assumed risk by entering their premises or hopping on a ride, but that isn’t always the best defense. If the park was negligent or the equipment faulty in any way, visitors are entitled to compensation for their injuries, so long as the injured party can prove, with the help of a Miami personal injury attorney, that the park failed to fulfill its duties to provide a safe environment for its visitors. If you or a loved one was injured in an amusement park accident, you have legal rights. Consult with the personal injury lawyers at Spencer Morgan Law to see what they are and how you can be justly compensated for your injuries or loss. Call 305-423-3800 to schedule your free consultation today.